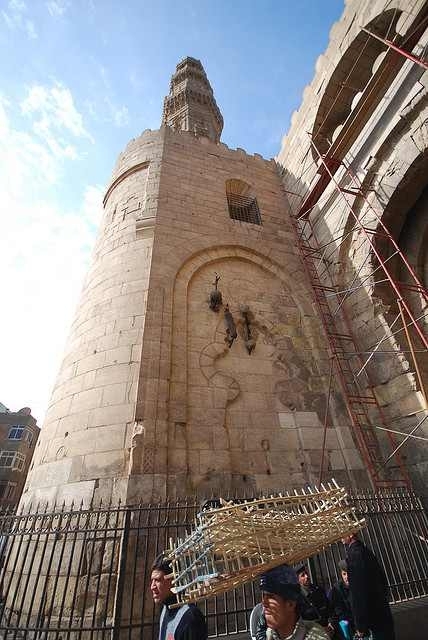 At the south end of Al-Muizz Al-Deen Street, there are two minarets that tower over the gates of Fatimid Cairo. This is Bab Zuweila, built as the south gate to the city in the 11th century. Its twin spires were added in the 15th century when the Mu’ayyad Mosque that sits just inside of the gate on the west side of the street was built by the Mamluk Sultan Mu’ayyad Sayf Ad-Din Sheikh. The Mosque of Sultan al Muayyad is an ancient Mosque in old Cairo, Egypt located next to Bab Zuwayla built by the Mamluk Sultan al Muayyad Saif al Din Shaykh from which the Mosque takes its name. The Building included a Mosque and madrasa for four madhhabs. The construction began in 1415 CE and was completed in 1421 CE. This Mosque has an interesting story, Sultan al Muayyad was imprisoned in the same place of the Mosque where he was Tortured and suffered a lot afterwards, he promised to turn the prison into a mosque and madrasa if he came to the power after restoring his freedom. After taking back his freedom, he just did it, transforming the prison into one of the most beautiful mosques and madrasa in old islamic cairo, he brought the greatest teachers of the day to teach about Islam, marble was brought from different locations in stunning colors to adorn walls and floors. Twin minarets of the mosque located up above bab Zawila which provide a unique photo shots since both are open to climb. Al Muayyad family’s mausoleum can be found inside the mosque inside a beautiful marble tomb brought from different locations. The legend goes that the Sultan was imprisoned in the prison standing at the same site under a previous Sultan. He vowed that he would turn the location into a center for worship and learning if he ever escaped and came to power. In 1412, Sayf Ad-Din Sheikh helped to overthrow Sultan Faraj, who was responsible for his imprisonment, and in the ensuing power struggle Mu’ayyad became the Sultan of Egypt. He made good on his pledge by building the Mu’ayyid Mosque, which contains a large space for Friday prayers as well as a smaller madrassa style mosque, where he employed the greatest scholars of the day to teach about Islam. Sultan Al Muyaddah spent a lot on the constructions of the mosque and madrasa collected through taxes and other parts from different mosques to include to his one. One of the most famous parts was brought to his mosque was originally belonged to the sultan hassan mosque. Today, the Mu’ayyad Mosque is still one of the most beautiful mosques in the city, a tribute to Sultan Mu’ayad’s reputation as a great patron of architecture in Cairo. 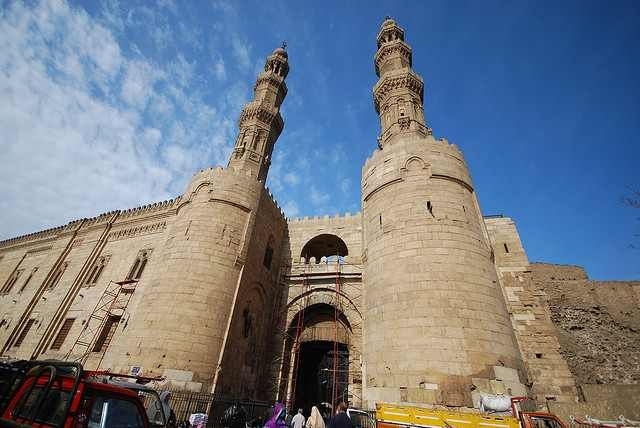 See the best of Islamic Cairo through one of our Cairo Tours and Excursions! 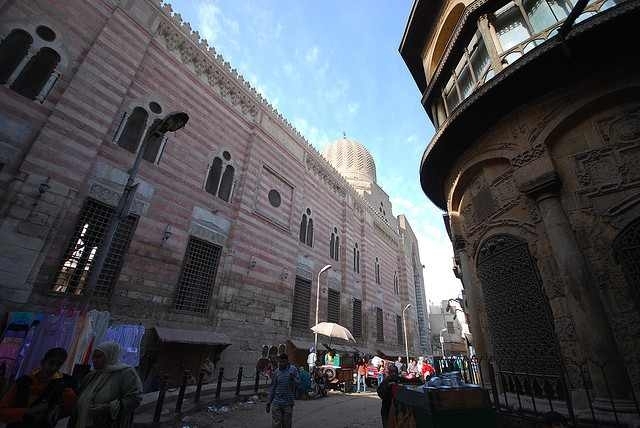 The complex of Bab Zuweila next to the mosque was recently restored. Inside you can find explanation of the gate’s construction and renovation through the centuries. Plaques even point out where pharaonic inscriptions can be found on the walls, etched into stones that were recycled from older pharaonic temples. 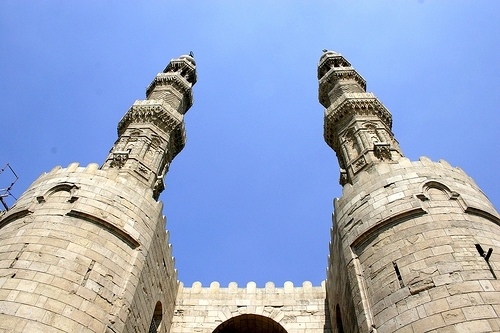 Climb up to the top of the wall and the minarets allow a beautiful view over Islamic Cairo, Azhar Park, and the Citadel. The twin minarets provide a unique photo opportunity. Since both are open to be climbed, you can send someone with a camera to the top of each one. 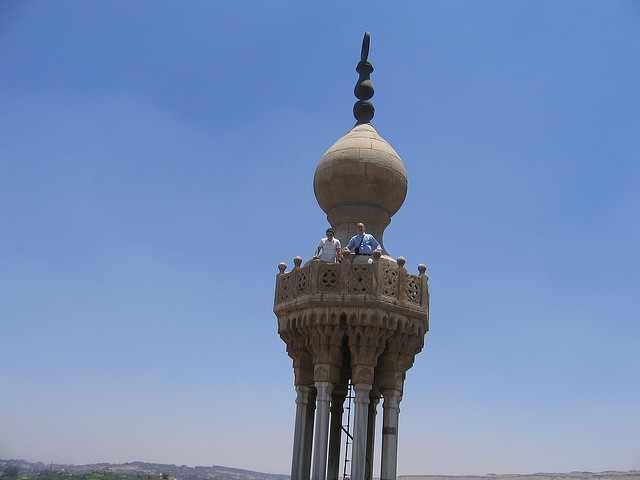 Both people can then take a picture of the other standing at the top of the opposite minaret. 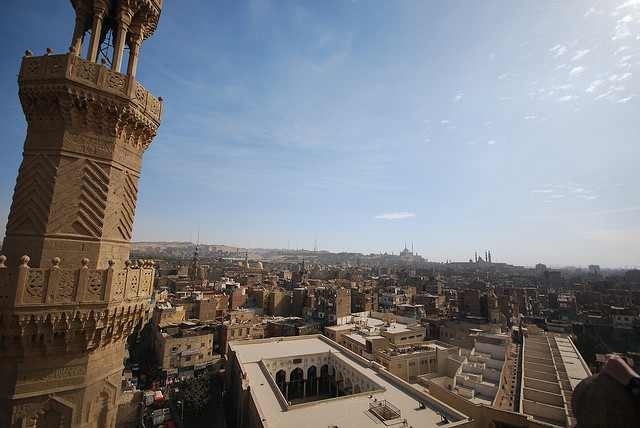 To have a super view of the Islamic Cairo,you have to climb the minarets as it offers a unique perspective view of the city to the north and the south. Next to the mosque there is a beautiful large building which looks like a small palace which in fact is the bath house “ Hammam” of Sultan Al Muayyad.